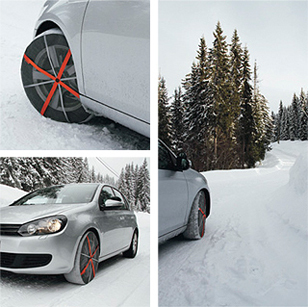 The AutoSock is tailored for situations where the duration of icy & snowy roads is normally short and does not justify special tyres or snow chains. It is suitable and permitted as temporary winter aid for vehicles, and is easy to mount and dismount. The AutoSock is machine washable and easy to store. Extensive research has brought the sock through a series of stages - from the first simple ones with a short life span which are beneficial just for specific conditions, to a robust sock suitable for most conditions. Traction tests with and without AutoSocks were performed along a straight 50 meter test course with a 7% uphill gradient. On ice/slush these tests showed a reduction in elapsed time for AutoSocks between 18 and 21% relative to summer tyres, 8% relative to unstudded winter tyres and 6% relative to studded tyres. On snow the reduction in elapsed time for AutoSocks was between 23 and 33% relative to summer tyres and 4% relative to studded and unstudded winter tyres. AutoSock AS has engaged leading research institutes in order to carry out various prototype tests using adequate industry standard measurement methods and equipment. 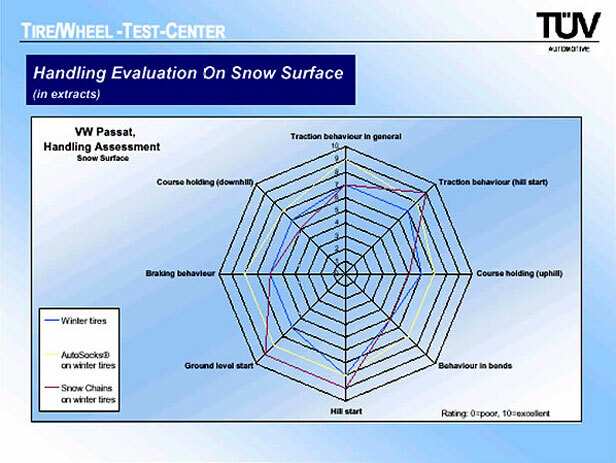 Initial field tests on snow and indoor tests on ice showed that the ice friction properties needed to be improved. Statistics show that during the winter more accidents occur on icy rather than on snowy surfaces. 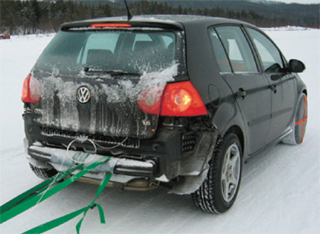 These included tests at the VTI Tyre testing facility in Sweden. VTI is the Swedish National Road and Transport Research Institute. AutoSock AS made use of special test machinery for ice that also eliminates human errors which affect braking efficiency on ice. Several tyre and car manufacturers have also used the same facility. Improve ice friction without compromising the snow friction properties. Make use of 'state of the art' knowledge about ski base sliding friction theory and ski base structures. 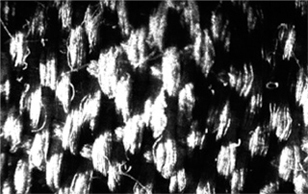 Exploit ways of objectively and scientifically describe the surface texture of different AutoSock prototypes in order to increase understanding about the prevailing friction. A surface pattern with a sufficiently high degree of coarseness to make the total contact area exposed to dry friction as large as possible under dry, wet, hard and soft snowy or icy conditions. Shown on the right. A combination of surface pattern, strength and elasticity that make the contact points sufficiently sticky under hard snow or icy conditions. AutoSock has easily got the best general traction, uphill and downhill course holding and brake behavior. AutoSock is only slightly behind snow chains when it comes to hill start traction and ground level starts.